Mushrooms straddle the line between healthy diet and beauty benefits. Anti-inflammatory properties of mushrooms can cure eczema, acne and rosacea. Vitamin D from the mushrooms when topically applied, because you can get higher concentrations in the skin this way, effectively treats acne. High content of hyaluronic acid promotes hydration of your skin. Anti-aging kojic acid effect prevents discolouration of the skin and protects your skin against external factors. The high content of copper, selenium and iron from the mushrooms stimulates hair growth. Studies has been shown the link between Vitamin D deficiency the acne breakouts we experience. Vitamin D, a fat-soluble vitamin, has ability to nourish and support the endocrine system. Mushrooms are rich source of Vitamin D, and a great way to balance hormones and clear skin from acne. There are so many new, often toxic chemical skin lighteners, but just a few natural ones with melanin inhibiting properties. Several mushroom varieties have been used for traditional skin whitening lotions in Japan for hundreds of years. 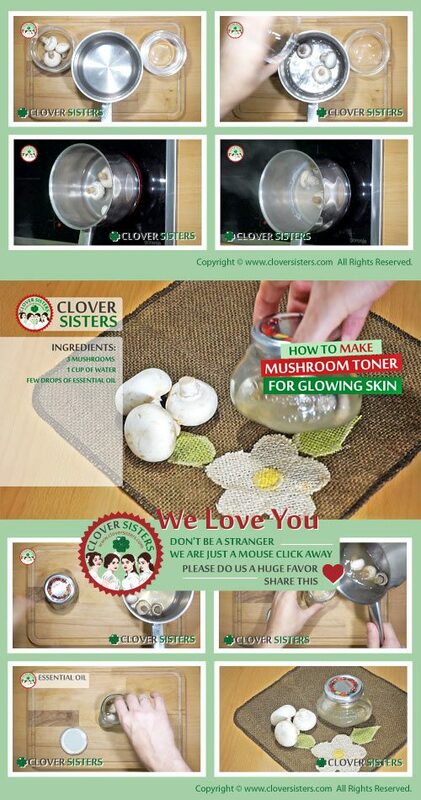 Those mushrooms have a natural skin whitening ingredient known as kojic acid. Research shows that not all hair loss is due to genetics, and that iron deficiency or anemia has a much closer link to hair loss and hair thinning than we initially realised. Mushrooms are rich source of iron and the key to restoring hair growth. Boil 3 mushrooms in 1 cup of water until liquid reduces to half. Let it cool down completely and then you can add few drops of your favorite essential oil. Strain the liquid and keep it in the refrigerator. Use it by dipping cotton ball and rub over the face and neck.